Want to know how your email marketing campaigns stack up against the competition? Your open rate is one of the most important performance metrics that you should pay close attention to. In this guide, we’ll share what’s a good email open rate and how you can improve yours. Measuring all of these things and working to keep them at healthy levels is necessary for any effective email marketing campaign. However, your campaigns will amount to nothing unless people are actually opening your emails in the first place! That’s why your open rate is so important, and that’s the metric we’ll focus on in this guide. If you are using any of the top email providers, they will have already calculated your email open rates for you. So out of the people who actually received your email, your open rate is the percentage of people who opened that email. OK, now that you know how to calculate your open rate, let’s get to the million dollar question. 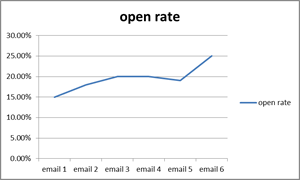 What is the average email open rate that you can expect to see? Across all industries, the average open rate for the second quarter of 2016 was 25%, according to Experian’s benchmark report. However, the more accurate answer really depends on your industry. For example, MailChimp reports that the average open rate for companies in hobby industries is 28.49%, whereas the average open rate in the marketing/advertising industry is 17.85%. That’s a pretty significant difference. So, if you really want to have a benchmark to measure against, you should be looking at the average open rates for your particular industry. That being said, no two email lists are the same, even in the same industry. So what you really should be focusing on is benchmarking and tracking your own email open rates. That way, you’ll be able to see what works (and what doesn’t work) for your own email list. Despite knowing the industry average open rates, you can’t set a truly realistic goal for your email open rates without benchmarking your current results! The first thing you need to do is go back and look at every email you sent over the past 3-12 months. Chart your open rates (and your click rates, unsubscribe rates, complaint rates, etc.) for every single broadcast email that you sent. Now, you can calculate your average open rate (and click rate, unsubscribe rate, etc.) over the past 1-4 quarters. To calculate your average open rate during a specific period, add up all of your individual open rates, and divide by the total number of emails sent during that period. This is your baseline. Don’t forget to also establish a baseline for your click rate, unsubscribe rate, etc. Next, take a look at any outliers–good or bad. Did a particular email do really well, or really poorly? If so, do you have a theory about why it did better or worse than the others? Make note of each of these outliers. We would want to take a look at that particular email to try and figure out why it didn’t do as well as the others. Next, look for any patterns that emerge. Does a particular topic do really well, or really poorly? What about your send time– does a specific time of day do better or worse than average? What types of subject lines performed better or worse? Take notes and use this information to improve your future campaigns. Finally, set a goal for your open rate (and all other performance metrics too). How much would you like to improve your open rate over the baseline? Now is a good time to actually go back to the industry averages and see where you stand. Don’t obsess over these numbers, however– use them to help you establish a realistic goal for yourself. If after benchmarking your results, you find that your open rates are way lower than the industry average, you may have a problem that needs to be addressed. If you purchased an email list, you can expect open rates well below the industry average. (Never, ever purchase an email list!) The same goes for lists that were acquired without properly qualifying subscribers. If you send the same email to every single person on your list, you’ll never get the kind of engagement you’re looking for. If you have a lot of people on your list who are inactive (they haven’t engaged with your emails for a long time), then that will hurt your inbox deliverability and your open rates will plummet. These are the main reasons why you may have a low email open rate. So how do you actually go about fixing those issues? Well, here are some tips for you. So far, we’ve shared the average email open rate across all industries, and the specific open rates per industry. We shared the 5 steps to benchmark your own email open rates. We also shared the top 4 reasons why you may have low email open rates. Before asking anyone to join your email list, make sure to qualify them with a relevant lead magnet. Do not try to attract anyone and everyone to your email list. For example, avoid using giveaways that most people would want, such as an iPad giveaway. Instead, give away something that only your target customers would want, such as a free sample of your product. Most marketers send broadcast all of their emails to everyone on their list. This is a lazy way to do email marketing, and it doesn’t work well. To make sure that your emails are actually getting opened, segment your list based on interests, purchase history, location, etc. That way, your subscribers will be more interested in the emails you send them, and will be more engaged with your email list. 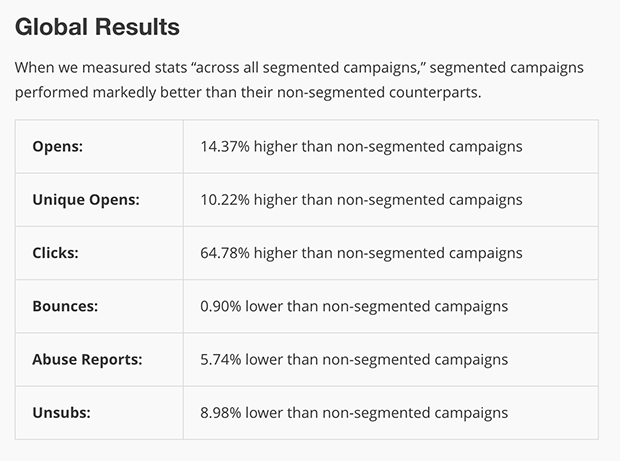 In fact, segmented email campaigns perform 14.37% higher than non-segmented campaigns. For ideas to segment your list, check out our guide on 50 Smart Ways to Segment Your Email List Like a Pro. Sending your emails at the right time is really important for increasing your open rates. In general, send your emails between 8:30-10:00AM, 2:30-3:30PM, or 8:00-midnight. This will avoid the times when most people are cleaning up their inbox and more likely to delete your email without reading it. 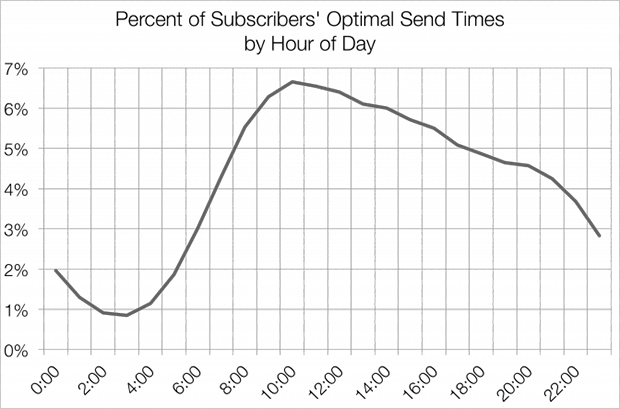 For more information on the best send times and dates, check out our guide on The Best Time to Send Emails (Here’s What Studies Show). In a direct subject line, you tell the subscriber exactly what to expect in the email, and they open it because that’s something they really want. For example, “How to Get 1K Subscribers in 7 Days” is a direct subject line. A curiosity subject line, on the other hand, entices people to open because they are curious to know what’s inside the email. For example, “I can’t believe this just happened…” is a curiosity subject line. You should be using both types of subject lines in your email marketing campaigns. This way, you keep things interesting for your subscribers and they will be more likely to open. For more help crafting subject lines that get opened, check out our guide on the Top 101 Email Subject Lines to Boost Your Email Open Rates. As we explained above, if you have a lot of inactive subscribers on your list, this will hurt your deliverability. So if you see that specific individuals never open your emails, don’t be afraid to remove them from your list. If a subscriber hasn’t engaged with any of your emails in the past 6 months or so, send them an email campaign to attempt to re-engage them. If they don’t re-engage with your list, then you’ll need to either unsubscribe them, or move their email over to another list that you only email on rare occasions. If you find that you have a lot of inactive subscribers, or you haven’t emailed your list in a long time, you should probably go one step further and use a list cleaning service such as BriteVerify or TowerData. Did you know that mobile email accounts for as much as 70% of your email opens (depending on your target audience, product and email type)? 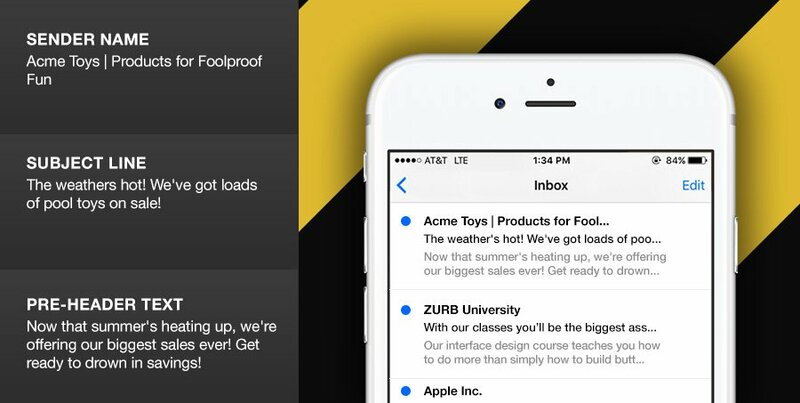 To ensure that your emails get opened on mobile, keep your email subject lines brief. 6-10 words or 25 characters is the sweet spot. That way, even people on mobile will be able to read them. You should also double check how your subject lines will appear on mobile before settling on them. Zurb has a really great, free tool called TestSubject that you can use to see exactly how your subject lines will appear on various devices. Avoid keywords and phrases often associated with spam. Never use ALL CAPS (the equivalent of yelling through email) or excessive exclamation points. If you notice a particular email campaign has an unusually high bounce rate, check the bounceback records — they may provide insight as to why your email was caught in spam. For more help getting past spam filters, check out our guide on 11 Reasons Why Your Emails Go in the Spam Box (and How to Make Sure they Don’t). If a reader doesn’t recognize the sender of an email, then they’re much more likely to delete it, or even hit “Report as Spam”. So make sure that you are using either your individual name or your brand name in the From field instead of just your email address. For even more tips to improve your email open rates, check out our guide on 10 Easy Ways to Improve Your Email Open Rate. That’s it! Now it’s your turn. 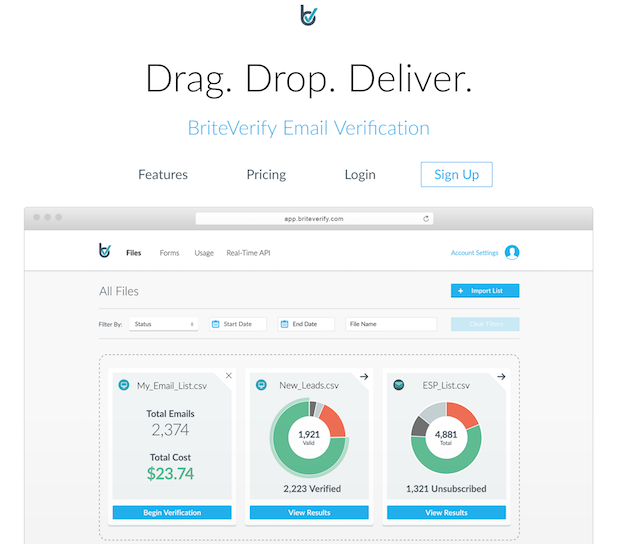 Go ahead and benchmark your email open rates using the 5-step process above. Then take a look at your industry average to see how you measure up, and set a realistic goal for improving your open rates. If you enjoyed this guide, you may also want to check out our complete guide to email marketing for beginners. Enjoyed your insights. I have a unique situation. My association has unbelievably high opt-out rates. Due in part to multiple emails – 15 to 20 per week. We have agreed to go to a single general email, but our opt out rates have destroyed the customer base – what now? Hi John, a good place to start would be segmenting your list more. We’ve got an email list segmentation guide that can help with that. And be sure to follow us on Twitter and Facebook, where we’ll let you know about a couple more related guides we’re publishing soon.